Kirill not present for Putin's great speech to the Duma. While Russia follows in the footsteps of the empire of Ivan the Terrible, the Orthodox Churches of Ukraine are pushed towards autonomy by Moscow. The Moscow Patriarchate risks being a minority in the next pan-Orthodox Council. Moscow (AsiaNews) - When last March 17, Russian President Vladimir Putin addressed the federal parliament in impassioned defense of Great Russia, to justify the annexation of the Crimea, the expressions on the faces of the front rows of the assembly betrayed an unusual concern. Amid the Imam's turban and the rabbi's hat, the absence of Patriarch Kirill's white tiara. Two rows behind the veiled miter of his vicar, the elderly Metropolitan Juvenalij, nodded uncertainly. He was sent to represent the Patriarchal Church, whose blessing was essential to confirm the necessary re-appropriation of the "holy land" of the Crimea. Kirill's absence was justified by his spokesman with uncertain references to his state of health (but the day before he had regularly presided over a long celebration) and the devout silence of Lent (but this should also apply to Juvenalij) . In reality, the absence of Kirill's blessing demonstrates the extreme embarrassment of the Moscow Patriarchate over the Ukrainian crisis, which threatens to upset even the structure of the same ecclesiastical institutions, and obliterate the enlargement projects pursued with great tenacity by Kirill himself in recent years. It seems that Putin has gone too far for his spiritual fathers. Kirill does not lack in patriotism, rather he has been its primary protagonist and custodian: since the time of Gorbachev and Yeltsin, the then Metropolitan Kirill Gundjaev always stood out as the main inspiration for a new post-Soviet state ideology, based on the restoration of the ideal of Holy Russia, seen as a Church-State capable of affirming itself at home and abroad as a great defender of Christian values ​​in a secular world. Kirill is the very expression of the model first proposed by the monk Joseph of Volokolamsk who in 1500 created the idea of the "State constituted by the Church", one of the favorite expressions of the current patriarch, realized by Tsar Ivan the Terrible , the true figure of reference of his current successor Vladimir Putin. Yet today, when 95 % of the Crimean Russians enthusiastically approve the return to Mother Russia, and the vast majority of Russians are proud to show even through force that the country opposes the corrupt intentions of the West, the patriarch withdraws within an ascetic in silence. The fact is that Kirill had gambled everything on Ukraine, and certainly not on the tiny Crimea or on some eastern province thereof. In the five years since his election, the patriarch has visited the country at least 30 times, going everywhere, even the most Western and anti-Russian dioceses, which his predecessor Alexy II was afraid to visit The head of the Ukrainian section of the Patriarchate, Metropolitan Vladimir Sabodan of Kiev , was included by Kirill within the Synod of Bishops in Moscow, the true governing body of the Russian Orthodox Church, with a title of honor almost equal to his own, and he had co-opted other members of the Ukrainian jurisdiction , seen as a quasi-autonomous Church, but well within the structure of the Moscow Patriarchate . And now what will happen? Will a Church independent from Moscow be created? And what to do with the diocese of Crimea, now Russian on a civil level: will it pass directly under the Moscow Patriarchate? And what if Kiev does not agree? This prospect terrifies Kirill more than one can imagine. On an ecclesiastical level Ukraine counts for little less than half of the parishes subordinate to the Moscow Patriarchate (13 thousand as opposed to 15 thousand Russian), and about 60% of the clergy is from Ukraine, including many bishops active in Russia itself. Aspirations for autonomy have grown in recent years in Ukraine, which desires complete autocephaly and independence from Moscow. Moreover, the seat of Kiev is historically the original one, from which Moscow separated only in 1589. Currently, the Metropolitan of Kiev Vladimir Sabodan, almost eighty years old, is in bad health, and Kirill is raising some heartfelt prayers that the Lord preserve him for as long as possible: the election of a new Metropolitan right now would certainly be accompanied by strong demands for autonomy . The Vladimir's vicar, Metropolitan Onufrij Berezovsky, originally pro-Russian, has increasingly been drawn towards the defense of the integrity of the Ukrainian state and its independent church, and the other bishops are even more explicit in this regard. The Moscow Church of obedience is beginning to appear to Ukrainians as the "Church occupier", which could lend renewed authority to the independent Ukrainian Orthodox Church of Patriarch Filaret Denisenko, which may be greatly diminished, but is still large . Not to mention the extreme push for autonomy of the Greek - catholic Church led by Archbishop Sviatoslav Sevchuk , which has its stronghold in western Ukraine and which was the greatest supporter of the Majdan protests and the revolution taking place in Kiev. 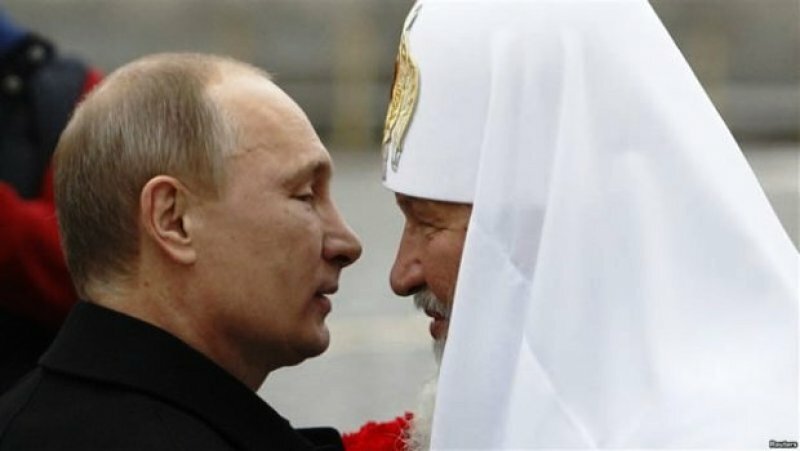 Kirill is also afraid of losing his dominant position over the entire Orthodox communion, which in 2016 will meet at the Phanar for the great pan-Orthodox Council, the first in the entire history of Orthodoxy. Currently Moscow accounts for 70% of all Orthodox in the world. If its jurisdiction was halved, it might end up in the minority, and have the great success of the convocation of the Council of Constantinople come back to haunt it. This, in fact, may become the grave of Russian ambitions to lead the Christian world in opposition to (or at least on par) with the Pope of Rome. The great Russia, in annexing the small Crimea, instead of expanding will ultimately become smaller and smaller.